So this may be a while off, but I couldn’t resist posting about something with the name The Hen Commandments. TerrorBull Games has the game mechanics completed, but will be launching a Kickstarter soon to finalize art and get the game manufactured. 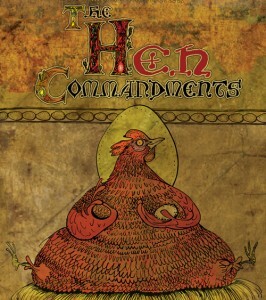 The Hen Commandments is a party game for 3-8 players where the players are trying to create a new religion. Each player is also trying to become the best disciple of the Holy Chicken by best figuring out what the heck the Holy Chicken is really talking about. One of the coolest things about the game is how the Holy Chicken lays 6 eggs at the start of each of 10 turns, each containing a word that must be strung together with the others to create a commandment. Players then play cards of themes that best fit the commandment. The person who has had the most of their themes judged to be the best by the end of the 10th commandment is the winner. There’s probably a ton of chicken puns I could have laid in there, but this is the only one you’ll be getting from me.